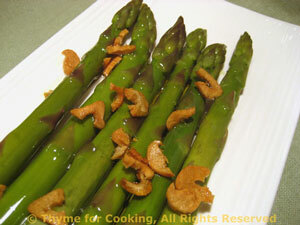 Roasted Asparagus, Garlic Chips, Thyme for Cooking spring vegetables. We eat a lot of garlic. If you don't want the extra garlic just drizzle some melted butter, a sprinkle of thyme and a little lemon juice over the cooked asparagus. Put a drizzle of oil on a baking sheet - one with a lip all around. I use a pizza pan. Roll the asparagus in oil (use your fingers!). Sprinkle with a little salt (sea salt is nice) and put in 400F (200C) oven, tips facing the oven door. Check after 12 minutes, cooking times depend on thickness. When done, put on a serving dish, drizzle with garlic oil and sprinkle with garlic chips. Slice garlic as thinly as you can. Put olive oil in a small frying pan and, over medium heat, fry garlic chips until brown and very crisp, about 10 minutes. Mind them so they don't burn. Remove chips and drain on paper towels. Keep oil warm until needed.